At Mozilla, we talk a lot about why the open web is important. We build open technology, and even advocate for certain policies that help keep the web open, interoperable, and ours. But at a certain point we have to ask — if not enough people understand the way the web works, or why keeping it open is important, are we doing all that we can? That’s why starting today, Mozilla is offering a series of four online courses designed to help everyone from formal educators to enthusiastic engineers learn how to teach the basic mechanics, culture and citizenship of the web. The courses are peer-powered by P2PU, and are free, online, and open to anyone who wants to participate. You can sign up for one or take them all, and you can go at your own pace. It involves making things using Webmaker tools and connecting and learning with others. Much of the activity takes place in an online discussion forum, and we’ll also host weekly video hangouts and community calls for real-time networking and support. how to connect with and leverage similar communities around the world. The courses are designed to lead into Mozilla’s Maker Party — our annual campaign, from July to September, during which volunteers from all around the world throw parties to celebrate and teach basic web literacy skills. Last year there were over 1700 events in 331 cities around the world. Web literacy is a focus on understanding the web from a holistic perspective, and includes more than just the basics of code. 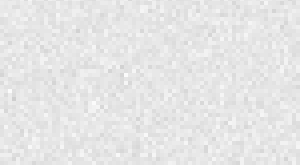 Things like understanding what a URL is, how a browser works, what online privacy and security mean, how to protect your data, how to work in the open and collaborate with others, etc. create a broader frame within which we can educate and empower more people to help protect the web as our largest publicly shared resource. Mix and match. 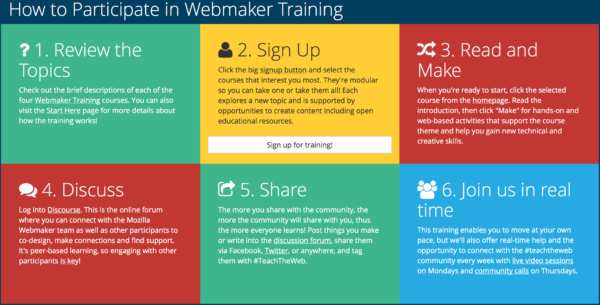 There are four different Webmaker Training modules to chose from. Each is a mini-course designed to help people teach and learn different aspects of Web Literacy. Take one, or take them all. Hosted by our friendly Mozilla Webmaker training team. With help from our global community of mentors, Peer 2 Peer University, and a new platform. Join live activities and get-togethers each week. Including a video session broadcast live on HOMAGO and archived on YouTube, and an open conference call to discuss the content and concepts. Read the step-by-step details on how to participate. Spread the word. Invite your friends, and use the #teachtheweb hashtag on Twitter. Want to volunteer or get more involved? Introduce yourself. Sign up for updates on Mozilla’s Maker Party.